The word “redefine” is usually overstated in restaurant parlance. Once in a great while, someplace truly deserves the verb. This column is about one of those rare occasions. Range is a sports bar like no other in the metro. It includes a fine dining room and six simulated golf rooms in addition to the sports bar. The furniture in all rooms is comfortable and handsome. Only Splash and Magnolia rank with this place in the category. One night, a friend with an injured back decided to call in help to a job because she had not been so comfortable sitting for days. Bar tops are quartz, in the “all that glitters is not gold” mode. Tile work in bathrooms and the bar are exquisite. All three rooms are served with food and beverage options that rank with the very best in the area. More than anything else, Range is a steakhouse of the highest caliber. All beef is USDA Prime grade, which only Fleming’s and 801 offer, to my ken. It’s a bargain compared to those places, too. They also specialize in free-ranged bison and elk. These are not gratuitous menu offerings; they are thoroughly worked out. The elk I was served was marinated in buttermilk, red wine and fresh herbs. The buttermilk removed the gamey taste. It was served in “hunter demi” of wild mushrooms and veal stock reduction. It was the best treatment of elk in my memory, and that includes some fantastic stuff Troy Trostel has been doing at Greenbriar. I also sampled a bison tenderloin that was seared perfectly and served alongside a pecan and pimento chimichurri that rivaled the meat in brilliance. A bison ribeye was damned near as good, but the chef refused to reveal his rub ingredients. It rivals Kim Wolf’s bison at Dubuque’s Pepper Sprout as the best in Iowa. The beef tenderloin I was served came with a horseradish crust of freshly grated horseradish root with butter and bread crumbs. It was so good I asked about it. Both my young server and a wily old manager reacted like everyone should know this was the perfect ap for beef steak. Now I know. 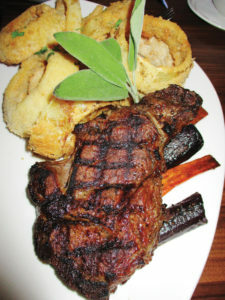 All steaks and chops here can be ordered with a choice of six special applications — de Burgo in a creamy version, Torrey Pines which is mushrooms with demiglace, Augusto which is the pecan chimichurri, Pebble Beach with shrimp and rub, Horseradish crust (yes) or Whistling Straits, which is a typical local sauce with blue cheese prominent. Range was excellent across the menu. Their french fries are coated and curled, two things I normally don’t like, and fabulous. Their onion rings were cut “Sioux City style” from the huge outer peels, something I usually don’t like, yet I loved them. Mashed potatoes included white cheddar cheese, a rare nod to local fashion. They are most interesting in croquettes that are dipped in panko and fried. French onion soup was made with veal stock and Lacey Swiss cheese. Pappardelle, flatbread pies, sauces, even rimmers (on cocktail glasses) are made from scratch with invention. Cocktails were splendid. Desserts were good, huge interpretations of standards. Six simulation golf course rooms are available for $45-55 an hour, per room. It’s like making a tee time on a golf course. Except that here you can dial up time of day, humidity, temperature, etc. The greatest golf courses in the world are available in vivid detail. Golfers are served in the simulation rooms where other TV sports are available. Don’t even think about trying to make a reservation for Super Bowl Sunday. Bottom line. This is the best sports bar food ever in central Iowa. It’s a really good steakhouse at sensationally good price points, too. Plus, you can simulate playing 18 holes at the greatest golf courses in the world. Why don’t you just move to Las Vegas and get it over with? So . . . am I just missing it or did you fail to tell us where this place even is? This is the second venue review I’ve read that fails to give the location. I know I can just look it up, but it’s a glaring omission to give such a great review and not say where it it.